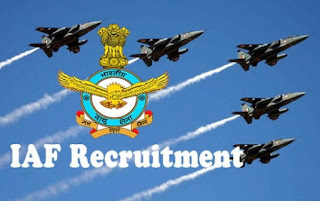 Group “X”: Applicants who have completed Passed Intermediate/ 10+2/ Equivalent examination with Mathematics, Physics, and English with minimum 50% marks in aggregate and 50% marks in English OR Passed Three years Diploma Course in Engineering in any stream or equivalent from a recognized Institute for Indian Air Force Recruitment 2018. Group “Y”: Applicants who have completed Passed Intermediate/ 10+2/ Equivalent Examination in any stream/ subjects approved by Central / State Education Boards with minimum 50% marks in aggregate and 50% marks in English or equivalent from a recognized Institute for Indian Air Force Recruitment 2018. Group “Y” (Medical Assistant Trade Only): Applicants who have completed Passed 10+2/ Intermediate/ equivalent exam with Physics, Chemistry, Biology, and English with a minimum of 50% marks in aggregate and 50% marks in English or equivalent from a recognized Institute for Indian Air Force Recruitment 2018.